An ambulance carrying the bodies of those killed in the fire exits the Virgen de Asuncion home, in San Jose Pinula, on the outskirts of Guatemala City, Guatemala, March 8, 2017. A fire that killed 19 girls at a home for abused teens in Guatemala on Wednesday started when some residents set mattresses ablaze, police said, after an overnight riot and attempt to escape from the overcrowded government-run center. 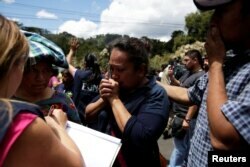 A crowd of relatives, some wailing with grief, gathered outside the Virgen de Asuncion home for children up to 18 years old, in semi-rural suburb San Jose Pinula, some 25 kilometers (15 miles) southwest of the capital Guatemala City. Nery Ramos, the head of Guatemala's national police, said at the scene that 19 people, all girls, were confirmed dead. Local hospitals reported at least 40 others being treated for burns. "This is a painful situation," Ramos said, adding that the fire started when a group of young people set light to sleeping mats. He said a group of residents were isolated by authorities at the center after an escape attempt on Tuesday night, and that police were investigating if the two events were connected. Plagued by Latin America's highest rates of child malnutrition and street gangs like the Mara Salvatrucha which often prey on minors, Guatemala can be a traumatic place to grow up. Conditions in public institutions are often dismal with widespread overcrowding. Burnt bodies partially covered in blankets were strewn across the floor of a blackened room in the home, pictures posted to Twitter by the firefighters showed. On Tuesday night, riot police were sent in to quell unrest over the crowded living conditions at the home. Some 40 residents escaped but were recaptured and isolated, Ramos said. The Virgen de Asuncion home had previously suffered from overcrowding, with Guatemalan media reporting that more than 500 people were crammed into the center designed to house 400. Distraught relatives said abuse was common at the center, which is run by the Ministry for Social Welfare. The ministry did not immediately respond to a request for comment, but was due to hold a news conference later in the afternoon. Family members react as they wait for news of their loved ones after a fire broke at the Virgen de Asuncion home in San Jose Pinula, on the outskirts of Guatemala City, Guatemala, March 8, 2017. Domestic worker Alicia Lopez, 50, had been outside the home for hours trying to find out what happened to her autistic 12 year-old son who came to the center with a drug addiction. She said he had been raped there last week. "I still don't have information. ... I want justice for him," Lopez said at the home, which takes in abandoned children as well as victims of abuse and trafficking. Andrea Palomo told reporters in tears that she had brought her 15-year-old son to the home to discipline him. But he told her he was mistreated and complained that gang members there tattooed the children, she said. Guatemala's ombudsman for human rights decides whether children are placed in the home or not and some parents praised the center. Businesswoman Cristina Puac, 59, said her adopted teenage daughter Gladys was placed there for being rebellious and aggressive, and stealing things. "When I came to see her, everything seemed fine," she said. "She never complained about anything."